There are a number of things you can do to stay safe this summer while still having a good time. The key to summer safety is knowing exactly what you need to look out for in Florida. Every State has its unique concerns, and in Florida some of these include pool safety, heat, mosquitos, and the ocean. Without proper precautions a day of fun in the sun can quickly turn into a mini nightmare that ends in Urgent Care, or worse the ER. Here are 5 things you need to look out for this summer to stay safe. Someone should always be on guard actively watching children while they are in the pool. It only takes a couple minutes for a child to drown. Keep barriers up and secured around all bodies of water. No child should be able to enter the pool area without the assistance of an adult. Florida law requires the use of barriers around all home pools. Important barriers include: childproof locks on doors exiting your house, a pool fence with self-latching gates, pool alarms and door alarms. Pool covers are another option although they must be fit exactly to your pool to be effective. Enroll your child in swimming lessons so that they know how to swim and are less likely to drown. 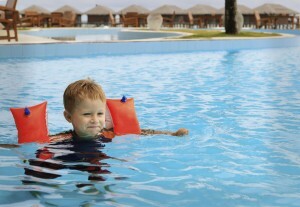 According to the American Academy of Pediatrics children 4 and older should be enrolled in swimming lessons. Children 1-3 may also be enrolled in swim programs, research finds the earlier children learn how to swim the less likely they are to drown. Parents and caregivers should also know how to swim. There has been a big push behind not leaving your children (or pets) in hot vehicles, not even for a couple of minutes. It only takes 10 minutes for a parked car to increase 20 degrees in temperature, even if you have the windows cracked. Children’s body temperatures rise 5 times faster than adults meaning they are more susceptible to death if left in a hot car. While out running errands this summer make sure your child is never left alone in the car, no matter what. Always check to make sure your child is not in the backset before locking your car. Don’t let your child play unsupervised near the car because they may accidently lock themselves inside. If you are depending on a caretaker to transport your child have them call you to let you know when they arrive safety. As temperatures increase in the summer the body requires more water to stay healthy and hydrated. Dehydration brings a number of children and adults into urgent care every year. Did you know that simply feeling thirsty is a sign of mild dehydration? This is why most people realize they are dehydrated after it is already too late. Regularly drinking water regardless if you are thirsty or not, is the best way to stay hydrated. It’s not jus the heat; during the summer people participate in more physical activities as well. One-hour prior to physical excursion the recommended dose of water is 16-20 ounces. While you are physically active you should drink 6-12 ounces of water every 15-30 minutes. Yellow or dark-tinted urine is a clear sign of dehydration. If your urine is a paler shade of white or yellow that means you are drinking enough water. Mosquitos are a part of Florida’s landscape and protecting you and your children against their wrath is important. Mosquitos are known carries of many diseases. You should keep insect repellent with you at all times, especially outdoors at night. Eating foods high in garlic and potassium are said to help ward off mosquitos, but keeping your skin protected with proper clothing and repellent will help the most. If your summer fun is interrupted by a cut, injury, illness or accident head on over to Urgent Medical Center for fast treatment. We will get you back to enjoying your summer in no time!